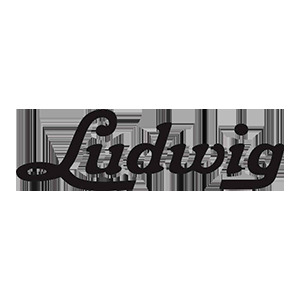 Browse Ludwig | Musical Instruments | GAK. From its humble beginnings in Chicago, Illinois to its present place at the centre of the drumming world, A Century of The Most Famous Name in Drums chronicles the ongoing history of the Ludwig Drum Company. The Atlas snare bag will fit, 14x5in, 14x5.5in and 14x6.5in snare drums. One of the primary reasons Ludwig is "The Most Famous Name In Drums" is the legendary Black Beauty Snare Drum. The Ludwig hardware pack also comes with a chain-drive kick drum pedal, making sure your kit is fully equipped with all the essentials. Aerodyne accessory clamps offer an extendable solution to placement dilemmas. Anchor your drum and enhance your sound with no drilling required. Enhance your sound with limitless mounting placement in a timeless classic design. Expand your set-up with unlimited cymbal placement flexibility. Atlas thrones come in Classic (blue/olive) coloured vinyl with embroidered block logo. This is a no-fuss, play-it-straight-out-of-the-box double pedal built for high performance and night-after-night reliability. The Atlas Pro performs with rock-solid reliance, eliminating annoying movement that interferes with precise play. Fully adjustable Snare Basket Clutch Mechanism, Designed for optimum performance and strength with any drum. Atlas thrones come in Pro (red/black) coloured vinyl with embroidered block logo. This is a no-fuss, play-it-straight-out-of-the-box single pedal built for high performance and night-after-night reliability. For the Gigging Professional, Medium/heavy-weight stands with all the functionality needed for medium-to-large venues. Affordably priced with all the necessary features needed for medium-to-large venues.